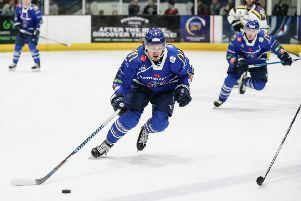 LUKE FERRARA has earned a first call-up to the Great Britain senior squad, one of four Sheffield Steelers picked to fight for a place to represent their country at next month’s World Championships in Croatia. The 22-year-old has come through the GB youth set-up, playing for the Under-18s and Under-20s and has excelled in his first season as a full-time professional with defending Elite league champions, Sheffield Steelers. He is joined on Pete Russell’s ‘long list’ by fellow Steelers, Jonathan Phillips, Ben O’Connor and Robert Dowd, although there is still no return for Jason Hewitt. Hull-born duo David Phillips and Matty Davies – both now playing for Manchester Storm – are both retained after playing in the recent 2018 Winter Olympics pre-qualifiying tournament in Italy where GB failed to progress after a last-day defeat to the hosts. Rotherham-born goalie Ben Bowns, formerly of Sheffield Steeldogs and Hull Stingrays but now plying his trade with Cardiff Devils, is also named, along with former Steelers’ players, Ashley Tait and Colin Shields. The squad will be cut by Russell to 28 for the pre-World Championship training camp on April 6, which will include two warm-up games against Poland in Nottingham and Coventry. A final 23-man squad for the World Championship in Zagreb will be named after the two games against Poland. GB will face hosts Croatia in the Division 1B tournament from April 17-23, as well as Estonia, Lithuania, Romania and Ukraine. “We have some exciting names on this list and I like the look of our squad,” said head coach Russell. “There really is big competition for the final 23 spots to go to Croatia, but the door is open for all 37 players. “We need to have the right balance from top to bottom on the final roster. GB’s warm-up matches against Poland will take place at the National Ice Centre on Saturday, April 9 and the Skydome Arena in Coventry 24 hours later. GB provisional squad for World Championships: Josh Batch (Cardiff Devils), Ben Bowns (Cardiff), Jonathan Boxill (Belfast Giants), David Clarke (Nottingham Panthers), Russell Cowley (Coventry Blaze), Jordan Cownie (Milton Keynes Lightning), Ben Daviess (Braehead Clan), Matty Davies (Manchester Storm), Robert Dowd (Sheffield Steelers), Robert Farmer (Nottingham), Luke Ferrara (Sheffield), Mark Garside (Belfast Giants), James Griffin (Milton Keynes), Matt Haywood (Braehead), Lewis Hook (Milton Keynes), Robert Lachowicz (Nottingham), Steve Lee (Nottingham), Joey Lewis (Heilbronner Falken), Stevie Lyle (Swindon Wildcats), Craig Moore (Dundee Stars), Evan Mosey (Nottingham), Thomas Murdy (Telford Tigers), Stephen Murphy (Belfast), Matthew Myers (Nottingham), Sam Oakford (Nottingham), Ben O’Connor (Sheffield), Craig Peacock (Belfast), David Phillips (Manchester), Jonathan Phillips (Sheffield), Mark Richardson (Cardiff), Colin Shields (Belfast), Zach Sullivan (Braehead), Paul Swindlehurst (Manchester), Ashley Tait (Coventry), Ross Venus (Coventry), Jonathan Weaver (Telford), Mike Will (Cardiff). To buy tickets for GB against Poland at the NIC in Nottingham log on to the National Ice Centre website at www.motorpointarenanottingham.com or telephone 0843 373 3000. To buy tickets for GB against Poland ain Coventry log on to www.planet-ice.co.uk/arena/Coventry or call 02476 630 693.